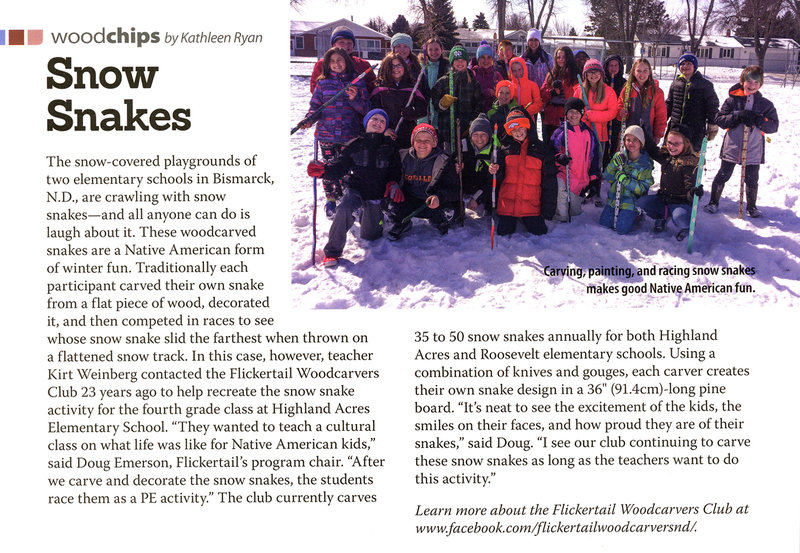 The Winter 2017 (Issue 81) of Woodcarving Illustrated featured the Flickertail’s involvement with a Snow Snakes activity on page 96. Click image to enlarge. Bismarck Tribune – June 12, 2016 – Long time Flickertail member Frank Koch passes away. Bismarck Tribune – December 23, 2015 – Long-time Flickertail member James Lindseth passes away. Bismarck Tribune – July 30, 2014 – Founding member of Flickertail, Arthur Tokach passes away. Bismarck Tribune – June 18, 2014 – Flickertail member Robert Matzke passes away. Bismarck Tribune – March 6, 2013 – Flickertail member Michael Senger passes away. Bismarck Tribune – December 14, 2011 – Flickertail founding member John Yonker passes away.